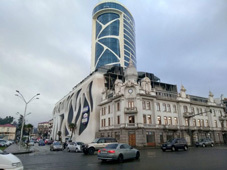 The Emergency Management Service of Georgia is asking for the suspension of operation of hotel and casino Welmond in Georgia’s Black Sea coastal city Batumi due to the breach of safety and fire norms there. The agency reports that Welmond, which is former Leogrand hotel, where 11 people died, and more than 20 were injured in November 2017 fire, still has no fire safety systems installed. The Emergency Management Service gave the hotel administration time until 18:00, August 17 to take the guests and staff out of the building and suspend operation until all the shortcomings are eliminated. Emergency Management Service reports that this year the specialists conducted monitoring and fire-technical inspection of the hotel and casino three times and issued 43 recommendations, most of which have not been fulfilled yet. According to the specialists, there is no anti-smoke system in the building, adding if there occurs fire again people will not be able to leave the hotel timely. The Emergency Management Agency has appealed to the court to suspend the work of the Hotel and Casino Welmond building for the safety of its visitors. The court satisfied the appeal and ordered the suspension of the work of the hotel. “As soon as the hotel begins to fulfill its obligations, we are ready to support the restoration of the operation of the hotel in the shortest possible time,” the statement of the Emergency Management Service reads. The hotel administration asked the agency to let them operate until the end of the tourist season. The lawyer of the hotel, Kakhaber Tsereteli says the administration will obey the court ruling, but they request some more time. “We are asking for temporary exploitation right. It is the middle of the tourist season now, and closure of the hotel will result in a huge financial loss for the administration,” the lawyer stated.